Get Ginspired – mix your perfect G & T for 5.00! The perfect G & T is a true work of art and throughout the Festival you can have the opportunity to create your own. Simply choose your mixer, botanical and garnish from the selection on your order pad and your lovely bar tender will mix it up with a shot of Bombay Sapphire. All for just 5.00! 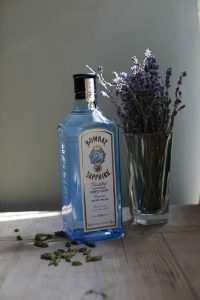 What’s more the lovely people at Bombay Sapphire have given us a pair of tickets for a VIP day experience at Laverstoke Mill, Hampshire their stunning distillery. So whether you are a purist and prefer to keep your G & T classic or want to spice it up a little get #ginspired this Festival! *Competition closes on the 15th October 2017 and the winner will be announced by the 31st October. Prize is a VIP experience for two to Laverstoke Mill, Hampshire. Prize does not include travel or accommodation. Winner and their guest must both be over the age of 18. There is no cash alternative to the prize.